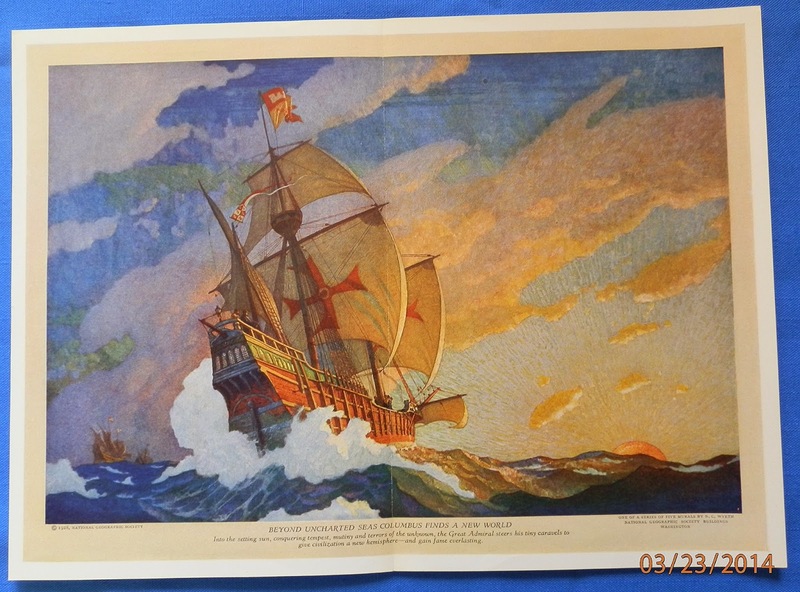 In honor of Columbus Day I found myself contemplating a picture on the wall of my breakfast room. Well, the breakfast room that has turned into the cat room. The cat likes it back there with his toys and his food and his scratching post. But once upon a time it was my breakfast room and after I went to Monet's house in France, I did what Monet did and painted it yellow and covered the walls in pictures. They were pictures people gave me, or the work of local artists that I bought, or things I bought at sales. "Beyond Uncharted Seas Columbus Finds a New World." "Into the Setting Sun, Conquering Tempest, Mutiny and Terrors of the Unknown, the Great Admiral Steers his Tiny Caravels to Give Civilization a New Hemisphere - and Gain Fame Everlasting." Who could resist such a print? Not I! That is a picture of it up above although I got it off the Internet because it is easier than taking a picture of the one on my wall. My print is framed I will have you know. Now I am glad I have that picture because I am writing about another famous Italian, Leonard Pennario. Pennario was a Columbus fan and so am I. And one house where Pennario's family lived in Buffalo is on Columbus Parkway, bringing this conversation full circle. Let my Columbus print be a lesson to all of us. When you see something you like at an estate sale, for whatever reason, do not question your judgment.